It will be a bittersweet experience for LeBron James when he takes to the floor with Dwyane Wade for the final time in the NBA on Monday. The former team-mates will line up opposite one another when the Los Angeles Lakers welcome the Miami Heat to Staples Center. James and Wade were part of the 2003 NBA Draft – selected first and fifth respectively – and claimed back-to-back championships together at the Heat in 2012 and 2013. 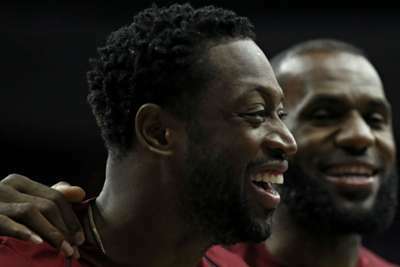 Wade will retire at the end of the season and while James is looking forward to going up against his close friend, he acknowledged there will be a "sour" note to proceedings. "It's bitter and it's sweet. It's sweet and it's sour," said James after his 20 points, nine assists and eight rebounds helped the Lakers move to 16-10 by beating the Memphis Grizzlies 111-88 on Saturday. "The sweet part is that I've always loved being on the floor with my brother. We struck up a relationship together at the [draft] combine in 2003, and it started from there. And the sour part about it is that this is our last time sharing the same court." On why they became so close, he said: "Sometimes it's just chemistry. Sometimes you can't even explain it. "And I bonded with Carmelo [Anthony] when I was in the 10th grade. I bonded with CP3 [Chris Paul] when I was in the 12th, and I bonded with D-Wade when we were both coming into the combine. "Some things you just can't explain, and that's why we have our brotherhood." Wade scored 25 points at Staples Center on Saturday as the Heat defeated the Los Angeles Clippers 121-98. He is looking forward to returning for a "special" game. "You're always excited to play the Lakers, and obviously, LeBron is there and [it's] our last time matching up, so it's definitely going be a little bit extra special than any normal game," Wade said. "I'm not going to sit here and tell you, 'Oh, it's another one of 82 [games in a season]' - no, it's not. Not for me. It's a game where I get to play against not only one of my best friends but one of the game's greatest players for the last time. "I want to win as a team, but I want to savour the opportunities."